The BMW Championship was introduced to the PGA Tour schedule in 2007 when it replaced the Western Open to become the third leg of the brand-new FedEx Cup playoff series. The Western Open dated all the way back to 1899 and only the Open Championship and US Open date back further. Following the Northern Trust and the Dell Technologies Championship, the BMW Championship is restricted to the top-70 in the FedEx Cup standings only and following this event, the standings are recalculated again and only the top-30 advance to the series deciding Tour Championship at East Lake in two weeks. Aronimink Golf Club, Newton Square, Pennsylvania. Aronimink Golf Club dates all the way back to 1896 but the current course - designed by Donald Ross - didn't open until 1928. The course was restored by Ron Pritchard in the late 1990s prior to it staging back-to-back AT&T Nationals (now called The National) and Gill Hanse has worked on the course in the last two years, returning a reputed 100 bunkers following the discovery of some early photos of the course. In addition to staging the AT&T National in 2010 and 2011, Aronimink also staged the 1962 US PGA Championship, won by Gary Player, and the 2003 Senior PGA Championship, won by John Jacobs. This is what Ross had to say about the track 20 years after he'd designed it. "I intended to make this course my masterpiece, but not until today did I realize I built better than I knew." Live on Sky Sports all four days, starting with live Featured Group coverage 16:00 UK time and full coverage 19:00. What Will it Take to Win the BMW Championship? Looking back at the results of the AT&T National in 2010 and 2011, the stat that stands out is Scrambling. The 2010 winner, Justin Rose, ranked number one, with the next five on the leaderboard ranking 11th, third, fourth, 15th and fifth and although the first and second a year later, Nick Watney and K.J Choi, only ranked 18th and 27th, the three players tied for third place, Charles Howell, Adam Scott and Jeff Overton (also third in 2011), ranked first, fourth and second for Scrambling. We've had 11 editions of this event since it became the third leg of the FedEx Cup and all 11 winners have been in really good form. And 10 of the 11 had finished inside the top-10 in either of the first two FedEx Cup Series events. The only exception was Zach Johnson who had been in fine fettle before the series began though (see below). If you want to nail that down further, Leishman was the seventh winner in 11 years to have finished inside the top-three in one of the first two Playoff events but somewhat bizarrely, nobody has yet won the BMW having finished inside the top-10 in both previous Playoff events. That eliminates the hat-trick seeking, Bryson DeChambeau, Tony Finau and Cameron Smith and it might not be a great omen for Dustin Johnson who finished 11th in The Northern Trust and seventh in the Dell. Here's a look at how all 11 tournament winners (since it became a FedEx Cup event) have done in the first two FedEx Cup Playoff events and how they'd fared before the series began. Marc Leishman 2017 - The Aussie had traded at odds-on the week before in the Dell Technologies before a late collapse saw him finish third. He'd missed the cut in the first FedEx Cup Series event but prior to that he'd finished fifth at the Quicken Loans National, six at the Open Championship, 41st at the WGC - Bridgestone Invitational and 13th at the US PGA Championship. Dustin Johnson 2016 - 18th at The Northern Trust (then known as The Barclays) and eighth at the Dell Technologies Championship (then known as the Deutsche Bank Championship) but before the series began he'd won the US Open and the WGC Bridgestone Invitational and he'd finished runner-up in Canada. Jason Day 2015 - first in the Northern Trust and 12th in the Dell Technologies, Day had already won the US PGA Championship and the Canadian Open. Billy Horschel 2014 - MC at the Northern Trust but runner-up at the Dell Technologies Championship. Zach Johnson 2013 - Sat out the Northern Trust and 27th at the Dell Technologies Championship but Zach had finished inside the top-eight in his previous five starts. Rory McIlroy 2012 - Made it back-to back wins after success at the Dell Technologies Championship, which had followed a 24th at the Northern Trust and victory in the USPGA Championship. Justin Rose 2011 - Sixth at the Northern Trust and 68th at the Dell Technologies Championship. Dustin Johnson 2010 - Ninth at the Northern Trust, having finished fifth in the USPGA Championship in his previous start, and 57th at the Dell Technologies. Tiger Woods 2009- Runner-up at the Northern Trust and 11th in the Dell Technologies and prior to that he'd finished second in the USPGA Championship after back-to-back wins at the Buick Open and the WGC Bridgestone Invitational. Camilo Villegas 2008 - MC at The Northern Trust, having finished fourth in the USPGA Championship in his previous start, and third at the Dell Technologies Championship. Tiger Woods 2007 - Sat out The Northern Trust and runner-up in the Dell Technologies Championship, having won his two previous starts at the USPGA Championship and the Bridgestone Invitational. From a course correlation angle, form at Donald Ross designed tracks tends to cross over well so take a look at form at Oak Hill Country Club, which was the venue for the 2013 USPGA Championship, won by Jason Dufner. Oakland Hills, which hosted six US Opens between 1924 and 1999, as well as the USPGA Championship in 2008, East Lake in Atlanta - home of the FedEx Cup finale - the Tour Championship - in two weeks time and check out form at Sedgefield Country Club, home of Wyndham Championship, staged just three weeks ago and won by Brandt Snedeker. I like the Wyndham link and if that's worth looking at then so too is the Pete Dye-designed home of the Players Championship, Sawgrass. Incredibly, five of the last seven Players winners have also won the Wyndham. Looking back over the event's history, with the possible exception of Camilo Villegas 10 years ago, whose price I can't recall or find, we haven't seen any wild outsiders win since it became a FedEx Cup event. Leishman was matched at [55.0] before the off last year and the two winners before him were first and second favourites. Previous results here don't help much. John Jacobs was in front after round one in 2003, and never more than two back, Rose was three adrift after round one but never headed after a 64 in round two and Nick Watney trailed by four after round one and by six after day two so it's a very mixed bag for such a small sample size. If you're betting in-running, look out for the tough par threes and the very long par three eighth in-particular. That was the hardest hole in each of the two AT&Ts staged here and the par five 16th was the easiest. Keep an eye on the weather. It looks like being a bit of a wet week and the wind is due to pick up on Sunday. That might just offer up the chance for someone to go against the head and make up lots of ground or even steel the event from off the pace. 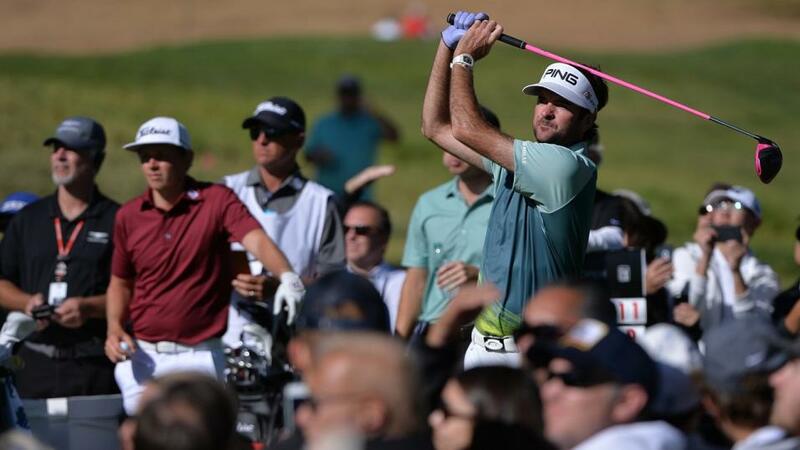 I'm starting to wonder what to make of Dustin Johnson. Capable of so much brilliance and yet very prone to a poor round or even a tournament wrecking couple of holes, it's difficult to commit at a single-figure price despite his obvious wellbeing and I'm happy to swerve him this week. Justin Rose looks a very obvious candidate after his gutsy second at the Dell Technologies, where he was in-contention from the start. First round leaders have a poor record in the event so the fact he ended up finishing second was a big plus. He's a great scrambler and Donald Ross track player and indeed, a course winner here, so there are plenty of positives and I wouldn't put anyone off him. You just know that sooner or later the defending FedEx Cup champion, Justin Thomas, is going to record another win as he's just so prolific but his form has been slightly regressive since he won the WGC-Bridgestone Invitational and I'm happy to swerve him. Brooks Koepka has held his form reasonably well since finishing fifth at the Bridgestone and winning the US PGA Championship but I wonder how long he can keep it up? He's finished eighth and 12th in the first tow FedEx Cup events and I'm happy to leave him alone too. Rory McIlroy was disappointing at TPC Boston after giving himself a chance on day four, eventually finishing outside the top-10 at a course he really loves, so he's easy to dismiss here and it's very hard to imagine Bryson DeChambeau having enough in reserve to become the first to win three FedEx Cup series events so I'm going to leave those two out of the staking plan too. A pair of third placed finishes in the first two Playoff events should be enough to stop Smith given no winner of the BMW has finished inside the top-ten at both the first two tournaments but his case is too strong to be ignored. In addition to those two thirds, he was seventh at the Wyndham last year and I just couldn't leave him out at [60.0] given I quite like his temperament in-contention. Bubba Watson is an insultingly big price given he's won three times this season and that he played really nicely last week to finish seventh and I couldn't resist Brandt Snedeker, this year's Wyndham winner, at the same price of [80.0]. Henrik Stenson has been largely out of form since he withdrew from the Scottish Open in July so he does fit the recent form trend at all but given how well he plays Donald Ross tracks I just couldn't leave him out at a triple figure price. C.T Pan finished second at the Wyndham and fourth last week so he could go well and last but not least, Korea's Si Woo Kim looked big given he too has won the Wyndham.